Our minikegs hold 8 pints of deliciously fresh, vegan friendly, ready-to-drink real ale. With no settling time required, these are the perfect companion for a BBQ or party. They are available across our core range, which now includes the lager-style pale ‘Kaiser’, and can be purchased from The Welbeck Farm Shop, as well as a number of local bottled beer shops. Please note due to the vegan-friendly lack of isinglass, the beer will appear naturally hazy. Cavendish, our signature blonde ale, plays tribute to the House of Cavendish, a family lineage which spans from the 1300’s through to the current family at Welbeck. Our Cavendish is a beautifully balanced blonde with crisp, zingy grapefruit flavours powering through. Our most popular beer is named after two famous Henriettas in the Welbeck family linage; Henrietta Cavendish-Holles, and Henrietta Scott. Our Henrietta is a clean-tasting, delicate golden ale, brewed with German Hallertau Brewers Gold which contribute notes of honeysuckle and fresh hay. Kaiser Wilhelm kick started The Great War following the assassination of Archduke Franz Ferdinand, however the archduke was almost killed in a shooting accident at Welbeck in 1913. Could it have altered the course of history? Our Kaiser uses premium German lager hops which give this extra pale beer it’s biscuity-sweet but refreshingly herbaceous flavour. Edward Harley, ‘The Great Collector’ was Welbeck’s great archivist, building an astonishing collection of books and art. Our Harley uses a blend of American and German hops to give an opulently floral honey-colour ale. Orange blossom and fresh zest are at the forefront with subtle sweetness behind. Portland Black recognises the Duke and Duchess of Portland who were in residence at Welbeck for centuries. 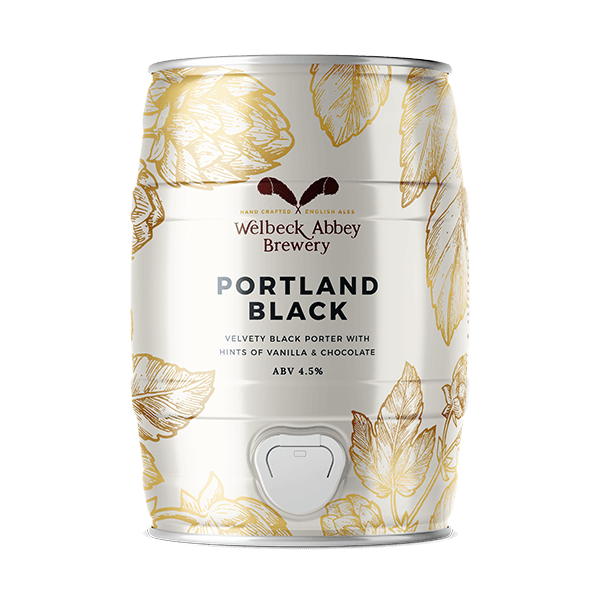 Our Portland black is a rich, velvety dark porter. Subtle smoke, chocolate and iced coffee flavours from roasted malts are topped off with a distinctly vanilla aroma. Red Feather takes its inspiration from the emblem of Welbeck and its crossed red feathers, which represent pride in the estate’s heritage and entrepreneurial spirit. Our Red Feather is a robust auburn ale. Plenty of crystal malt gives this beer a rich colour and combination of bold walnut and bitter-sweet caramel flavours.